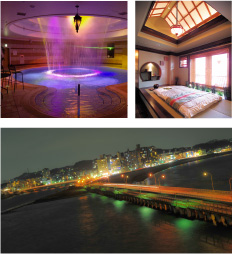 Autumn Day Plan for Enoshima Island Spa – Jarman International K.K. Satisfy your 5 senses this Autumn at Enoshima Island Spa. From October 19th through February 15th, indulge in a premium day plan to relieve your stress as we cool off this year in Tokyo. Be sure to do some island exploration and feel the energy of the nearby “powerspots” before your rejuvenating treatment. When you are ready to begin your spa plan, just come to the front desk in the spa. -Access to the entire facility for the day. 10 different mineral hot springs, heated pools, sauna, and relaxing cafes.